Tshepo started his dustbin art back in 2010, trying to raise funds to raise funds after receiving the Darmasiswa scholarship to attended the Institut Seni Indonesia Denpasar, an art school in Bali, Indonesia. 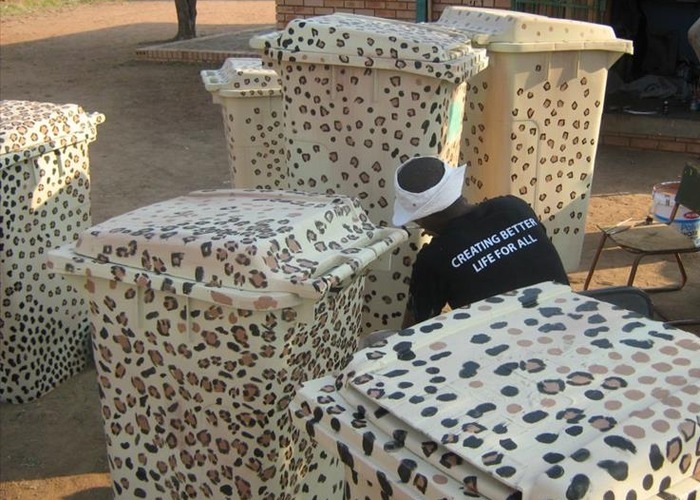 What started as a small way to raise money has now become a roaring success with many people buying his customised dustbins. He uses his work to make a statement about the environment and humanity. As beautiful as his dustbin art may be, there is also a strong message accompanying most of the art, with signs such as “don’t litter and do not do drugs,” among many others. Tshepo not only aims for his work to look good but to also make environmental and political statements. Each piece holds its own essential statement, and like many artists, Tshepo has a powerful voice through his art.